1793 was the only year of production for the Liberty Cap Left Half Cent. The total mintage for the year was 35,334 coins, all produced from July 20 to September 18. The Miss Liberty obverse design was based on sketches by the first Mint Director, David Rittenhouse, who was inspired by Augustin Dupre's beautiful Libertas Americana medal of 1782. The liberty cap (originally called the Phrygian cap) tradition dates back to ancient times, when liberated slaves wore the conical shaped headgear to signify their freedom. Over the centuries, the liberty cap came to symbolize the concept of freedom and the pursuit of liberty. During the Revolutionary War era, American colonists foisted the liberty cap upon a pole to rally the cause of independence. This concept was later depicted on numerous United States coins. The 1793 Liberty Cap Half Cent is a true rarity. Very few of them exist today. Over the course of many decades, its value continues to rise, far above that of more common dates of lesser numismatic significance. We can expect more of the same in the coming years. 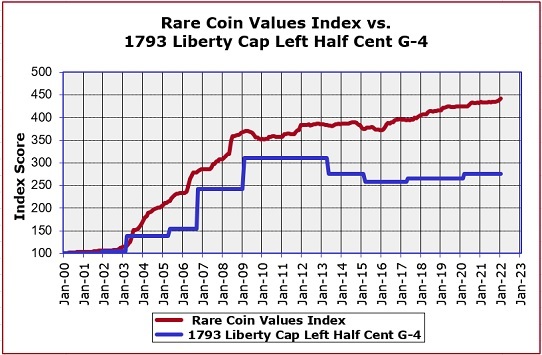 The blue line above represents the percent change since the year 2000 in retail value of the 1793 Liberty Cap Left Half Cent in G-4 condtion, starting at a baseline index of 100. The red line measures the overall direction of the rare US coin market during the same time period, as determined by the Rare Coin Values Index. The rise in value of the 1793 Half Cent rates slightly below the Index performance. The 1793 Liberty Cap Left Half Cent is one of 87 coins tracked in the Index, which is updated monthly.